Hamas is ruthlessly trying to crush dissent amid internal protests against the terror group's rule over Gaza that broke out Thursday. 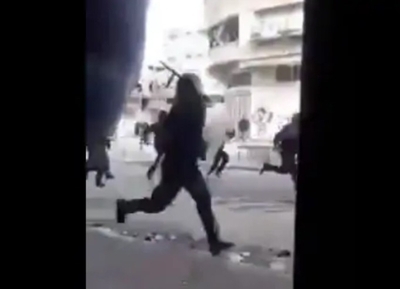 Hamas officials reportedly are beating protesters with clubs and using other violence – including live fire – to disrupt the protests, along with conducting arbitrary arrests of dissidents, human rights activists, and journalists. Hamas also continued to hold seven Palestinian journalists on Sunday for covering the demonstrations, according to a source from the Palestinian Journalists Syndicate speaking to The Times of Israel. The violence by Hamas against Palestinian protesters critical of economic conditions in Gaza has yet to draw significant international news coverage. And the Committee to Protect Journalists has not issued an alert. According to the syndicate, Hamas released 10 of the 17 reporters arrested since the onset of protests on Thursday. Four of the released journalists needed medical treatment. A United Nations official condemned Hamas's "brutal treatment" of the detainees. "I strongly condemn the campaign of arrests and violence used by Hamas security forces against protesters, including women and children, in Gaza over the past three days," Nickolay Mladenov, United Nations envoy to Israel and the Palestinian territories, said in a statement. Amnesty International issued its own condemnation Monday afternoon calling Hamas's actions "a flagrant violation of international law." That seems like a significant story, but most of the world has yet to be informed about it. "The crackdown on freedom of expression and the use of torture in Gaza has reached alarming new levels," said Amnesty's Deputy Middle East and North Africa Director Saleh Higazi. The statement came after Hamas detained a female Amnesty research consultant and questioned her for three hours, "during which four male interrogators subjected her to ill-treatment." Hamas also detained more than 80 protesters affiliated with its rival, Fatah, during the weekend. Demonstrations erupted on Thursday in multiple areas throughout Gaza to protest the standard of living and poor economic conditions under Hamas rule. Since taking control of Gaza in 2007, Hamas has consistently diverted international aid and financial transfers to bolster its terrorist capabilities, at the expense of societal concerns. That has contributed greatly to the electricity and water shortages Palestinians there face. Israel stood ready to help alleviate Gaza's energy crisis, but the Palestinian Authority balked, prompting a Hamas official to ask, "So who is besieging you, the people of Gaza?" Hamas critics rallied around the message, "We Want to Live! ", the Jerusalem Post reports. They were motivated by rising unemployment, chronic electricity shortages and new taxes. The electrical flow into Gaza is being curtailed by the Fatah-led Palestinian Authority. A 32-year-old Gaza man reportedly self-immolated, the kind of protest that helped ignite 2011-12 "Arab Spring" uprisings in Tunisia, Egypt and elsewhere. A two-year investigation by Human Rights Watch (HRW) released last year found that Hamas and the Palestinian Authority (PA) use systematic torture and repression to stifle any dissent against their rule. The PA in the West Bank and Hamas in Gaza conduct arbitrary detentions targeting people who criticized them, using broad legislation prohibiting activities seen as promoting "sectarian strife" or offending "higher authorities. Hamas's violent suppression escalated over the weekend to the point where the Palestine Liberation Organization (PLO) reportedly requested Egyptian and Qatari intervention to pressure the terror group. While Hamas uses violent and brutal methods to stifle dissent within Gaza, the terror group controls and fuels organized riots on the Israel-Gaza border. Hamas also encourages infiltrations and terrorist attacks targeting Israeli civilians under the guise of peaceful popular protests against the Jewish state. However, media attention predominately focuses on the "Gaza protests" that involve Israel's targeted response to violent protests on its border. If international rights activists devoted to the Palestinian clause truly cared about the plight of the Palestinian people, they would voice their concerns about Hamas's suppression tactics. Instead, there is a deafening silence as Hamas ruthlessly crushes the hopes of many Gazans seeking a better life.